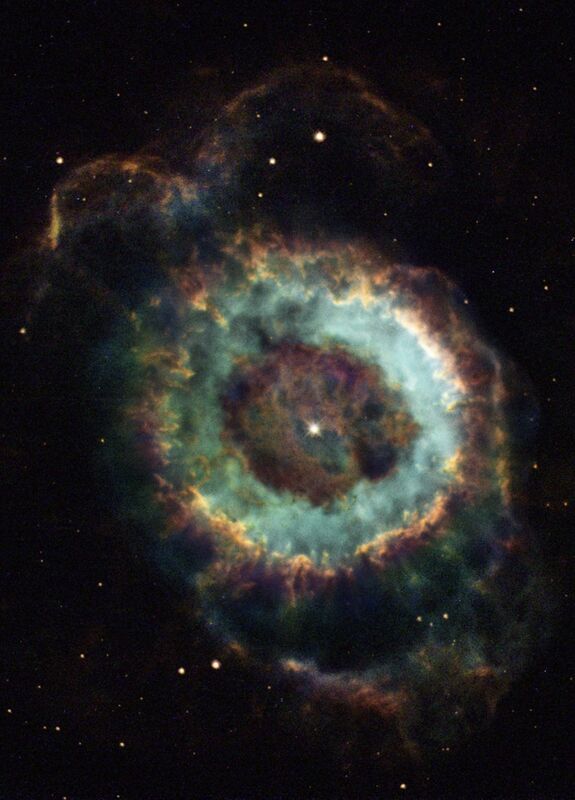 Hubble Space Telescope has recently obtained images of the planetary nebula NGC 6369. This object is known to amateur astronomers as the "Little Ghost Nebula," because it appears as a small, ghostly cloud surrounding the faint, dying central star. NGC 6369 lies in the direction of the constellation Ophiuchus, at a distance estimated to be between about 2,000 and 5,000 light-years from Earth. When a star with a mass similar to that of our own Sun nears the end of its lifetime, it expands in size to become a red giant. The red-giant stage ends when the star expels its outer layers into space, producing a faintly glowing nebula. Astronomers call such an object a planetary nebula, because its round shape resembles that of a planet when viewed with a small telescope. The Hubble photograph of NGC 6369, captured with the Wide Field Planetary Camera 2 (WFPC2) in February 2002, reveals remarkable details of the ejection process that are not visible from ground-based telescopes because of the blurring produced by the Earth's atmosphere. The remnant stellar core in the center is now sending out a flood of ultraviolet (UV) light into the surrounding gas. The prominent blue-green ring, nearly a light-year in diameter, marks the location where the energetic UV light has stripped electrons off of atoms in the gas. This process is called ionization. In the redder gas at larger distances from the star, where the UV light is less intense, the ionization process is less advanced. Even farther outside the main body of the nebula, one can see fainter wisps of gas that were lost from the star at the beginning of the ejection process. The color image has been produced by combining WFPC2 pictures taken through filters that isolate light emitted by three different chemical elements with different degrees of ionization. The doughnut-shaped blue-green ring represents light from ionized oxygen atoms that have lost two electrons (blue) and from hydrogen atoms that have lost their single electrons (green). Red marks emission from nitrogen atoms that have lost only one electron. Our own Sun may eject a similar nebula, but not for another 5 billion years. The gas will expand away from the star at about 15 miles per second, dissipating into interstellar space after some 10,000 years. After that, the remnant stellar ember in the center will gradually cool off for billions of years as a tiny white dwarf star, and eventually wink out.